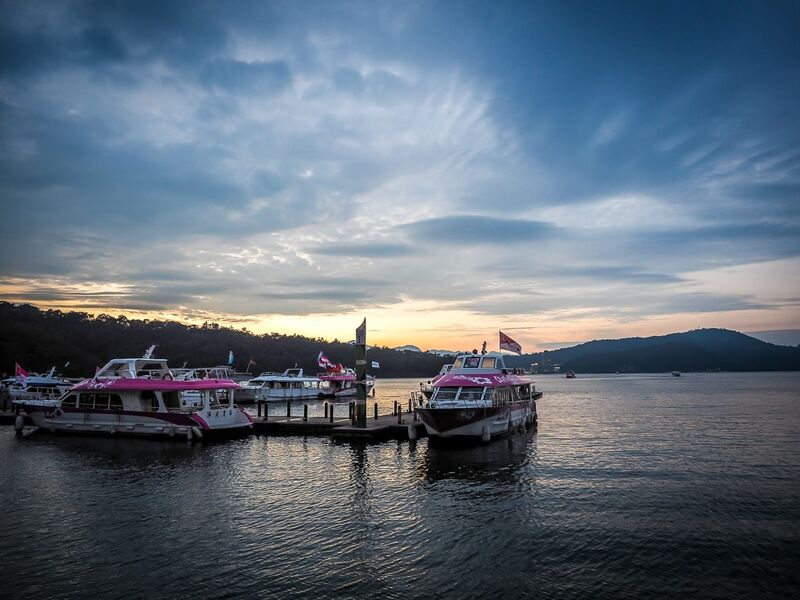 If you are going to Sun Moon Lake, one of the best places to visit in Taiwan, you can save some money by getting the Sun Moon Lake Pass, or “Sun Moon Lake Package”, which has many different options, including connections with Alishan and the Xitou Monster Village. I’m writing this article because the government website and Nantou bus website explaining the passes are not very clear. There are some points that are confusing and don’t make sense. Also, I want to help you decide if buying the Sun Moon Lake pass is worth it for you. 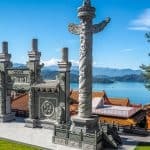 See the bottom of my article for information on where to buy all of the following Sun Moon Lake passes. 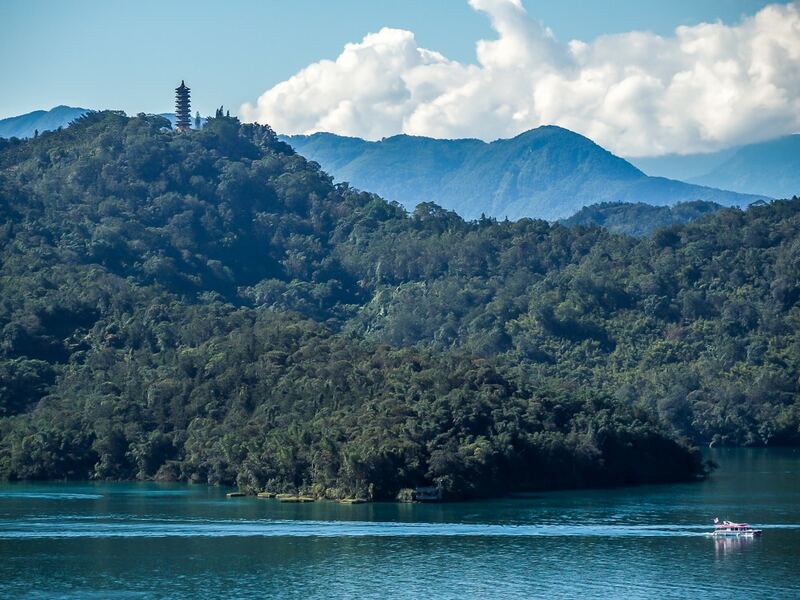 If you want to avoid the transportation and ticket hassle, you can consider joining a Sun Moon Lake tour. 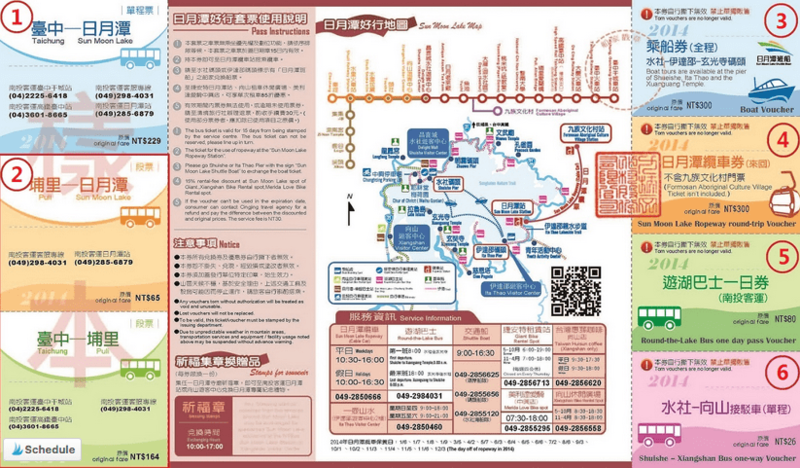 So what it means is that you get a return ticket from Taichung to Sun Moon Lake. On the way there (or back) you have the choice of stopping in Puli. It should say “Sun Moon Lake to Taichung” for one of them. For “Puli”, you have the choice of stopping at one of the following, which are all actually between Puli and Sun Moon Lake, not in central Puli city: National Chi Nan University, Paper Dome, Dayan, or Antique Assam Tea Farm. The two stops I would consider are Paper Dome, a church made out of paper, and Antique Assam Tea Farm, where you can learn about and buy Sun Moon Lake’s famous black teas. If you stop at one of these places between Puli and Sun Moon Lake, you can just get back on the next bus, so make sure you check the bus times. If you use all of your vouchers, then you save NT$545. Not too bad!! However, here are a few things to consider. If you are going to Sun Moon Lake on a day trip, you probably won’t need to take the boats and bus around the lake. You will probably choose only one or the other. And if you plan to ride a bike or rent a scooter to drive around the lake, you may not use either. But even if you don’t use one or both of of the bus/boat vouchers, you still save some money. And if you visit for two days, it is very useful, because you can take the boats one day, and buses the other day. Finally, you might choose to take a boat from Shuishe to Xuanguang only, or to Xuanguang and Ita Thao, but then bus back, so that you can see other spots like Ci En Pagoda and Wenwu Temple, which are not accessible by boat. 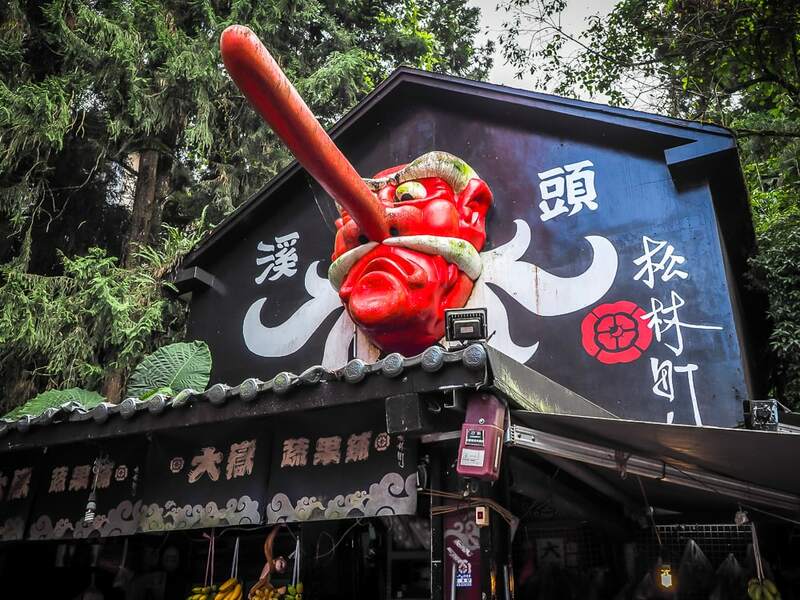 Do you really plan to enter the Formosan Aboriginal Culture Village? If you don’t, then this pass isn’t worth the money. We went to the Formosan Aboriginal Culture Village, and we didn’t think it was worth the money (see my full article on Sun Moon Lake for the reasons). If you only care about the views from the Ropeway but don’t want to enter the theme park, then choose the $730 pass. 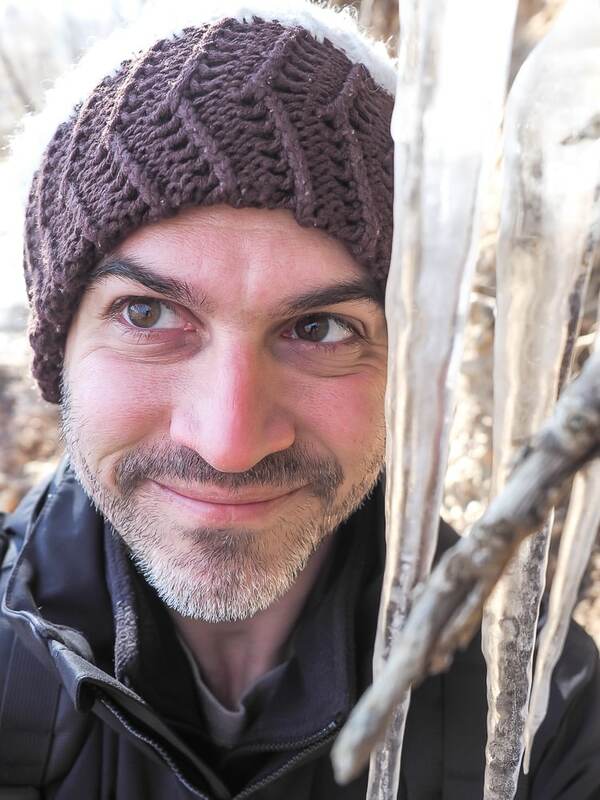 Why do they include a one-way ticket to Xiangshan Visitor’s Center? This is a pretty cool building on the western side of Sun Moon Lake, but it’s far away from all the other Sun Moon Lake sights on the eastern side of the lake, so only make the trip out there if you are really interested in this building and some views from the less touristy side of the lake. Otherwise, you probably won’t use this voucher. And if you do use it, you have to pay $25 more to get back to Shuishe. If you are traveling to Sun Moon Lake with kids, they don’t need a pass. Under 6 are free for everything, but 6-11 are mostly half price for everything (but only get a small discount for the Sun Moon Lake Ropeway). This pass is exactly the same as the above pass, except it doesn’t include entrance to the Formosan Aboriginal Culture Center. You still get tickets to take a ride up and down on the Sun Moon Ropeway and enjoy the views of Sun Moon Lake. Since I personally don’t think Formosan Aboriginal Village is worth the money, I think this is the best choice. But you only save about $365 if you use all the vouchers. And if you don’t use the boat voucher? You only save $65. So you need to think about which vouchers you will really use. This choice is also the same as above, but doesn’t include the bus to and from Taichung and the Formosan Aboriginal Culture Park ticket. Choose this one if you don’t need to take the bus to/from Taichung and don’t care about the theme park. You will save $305 is you use all the vouchers, but you basically don’t save anything if you don’t take a boat ride. Here’s an interesting choice. You get the return bus ticket from Taichung, round lake bus and one-way bus to Xiangshan, boat tickets, and a 1, 2, or 3-hour bike rental (depending on the quality of bike: Giant, Merida, or Suong-Meeng). The rental stations are in Shuishe, plus one Merida station in Xiangshan. I can’t confirm this, but I think you need to pay an extra NT$100 to take a bike on a boat. It would kind of be a waste of your bike rental time anyways. If you know the answer, please leave a comment at the end! An ID card is required for bike rental. If you don’t need the bus tickets, or want to have your bike for longer and take it on the boats, you can consider this bike and eco-friendly boat pass or bike, boat, and Sun Moon Lake Ropeway pass on Klook, both of which are great deals. Click this link to sign up for Klook and get NT100 off your first booking! 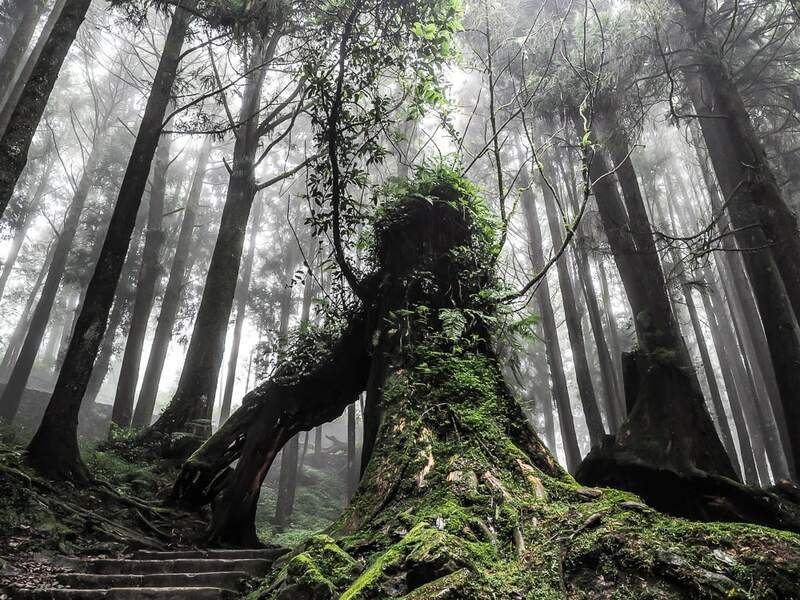 If you are planning to visit Alishan after Sun Moon Lake, this bus pass only includes the bus ticket from Taichung to Sun Moon Lake and Sun Moon Lake to Alishan, saving you about NT$73 in total. It doesn’t seem like you can do Alishan first, and it also doesn’t include your ticket from Alishan to wherever you go next (see more info on Alishan transportation in my getting to Alishan article. This pass also includes a “Shopping Discount Coupon” but no details are provided about what that means. If you are planning to visit the Xitou Forest Recreation Area (including Xitou Monster Village), this bus only pass includes the bus from Taichung to Sun Moon Lake, Sun Moon Lake to Xitou, and Xitou back to Taichung, and it seems like you go can in either direction (Sun Moon Lake first or Xitou first). The entrance to Xitou Nature Education Area is included (though we went up there for the Monster Village, which is free to visit). So altogether, this pass can save you NT$232. But if you don’t user the Xitou Education Area voucher, which costs NT$200, you only save $32. You can buy all the passes from the iBon machine in any 7-11, the Nantou bus window at Gancheng Train Station in Taichung, or the Taichung HSR station (1F exit 5). You can get a discounted Taipei to Taichung HSR ticket on Klook. It is also possible to arrange a private car from Taipei or Taichung to Sun Moon Lake. Click this link to sign up for Klook and get NT100 off your first booking! After you buy the Sun Moon Lake pass, you have to use it within 15 days. There is no reservation for seats on the bus. You just line up and wait. When you get on the bus, give the driver the voucher you want to use (#1 to Sun Moon lake, or #2 to Puli then Sun Moon lake). If you are planning to stop in Puli, you should tell the driver which stop you want. Arriving at Shuishe (Sun Moon Lake), a person will be waiting there to trade your boat voucher for a boat ticket. Then you can go to the Shuishe pier for the boat, go rent your bike, or take a bus around the lake (departing from the same spot, just go to the other side of the road). When you take the boat, you don’t need to budget much time for Xuanguang Wharf. There’s a wharf, a famous tea egg stall, some paths, and a temple. You might consider taking a bus from there to Ci En Pagoda, which is not too far away. You will probably spend more time at Ita Shao, where there is a bigger wharf, a village with lots of shops and food stalls, a great night market, the Thao Aboriginal Performance Center, and the Sun Moon Lake Ropeway is a 15-minute walk away. Ita Shao is also my favorite place to stay on Sun Moon Lake. See my Sun Moon Lake Guide for my favorite hotels in Ita Thao. See you soon, Sun Moon Lake! 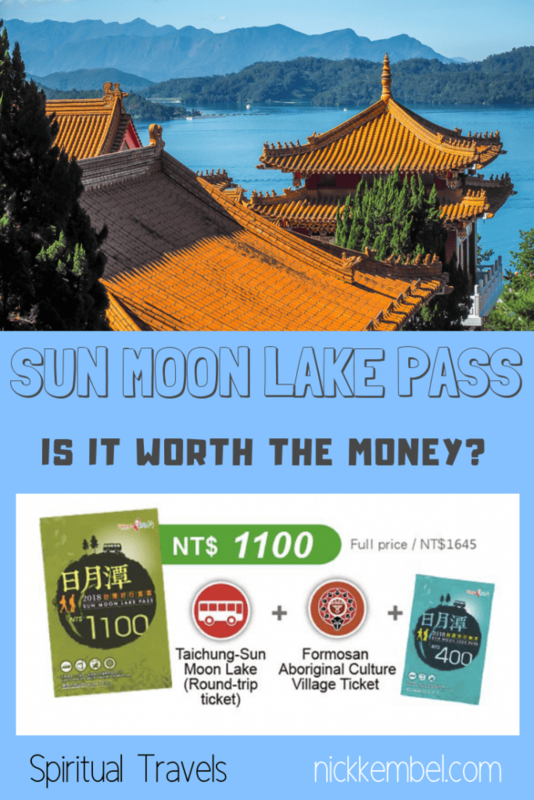 I hope this information was using in answer your question, “Should I get a Sun Moon Lake Pass?” Please see my other pages on Sun Moon Lake for planning your trip! Wow, this is very helpful!